O God, who from amongst the other angels hast chosen Gabriel, the Archangel, to announce the mystery of thy incarnation, grant us propitiously, that we who celebrate his feast on earth, may experience his protection in heaven. Who liveth and reigneth, world without end. Amen. So far in the Church's Calendar [since the beginning of the Liturgical year], we have not met with any Feast in honour of the Holy Angels. Amidst the ineffable joys of Christmas Night, we mingled our timid but glad voices with the Hymns of these heavenly Spirits, who sang around the Crib of our Emmanuel. The very recollection brings joy to our hearts, saddened as they now are by penitential feelings and by the near approach of the mournful anniversary of our Jesus' Death. Let us, for a moment, interrupt our sadness, and keep the Feast of the Archangel Gabriel. Later on, we shall have Michael, Raphael, and the countless host of the Angel Guardians; but to-day,… it is just that we should honour Gabriel. 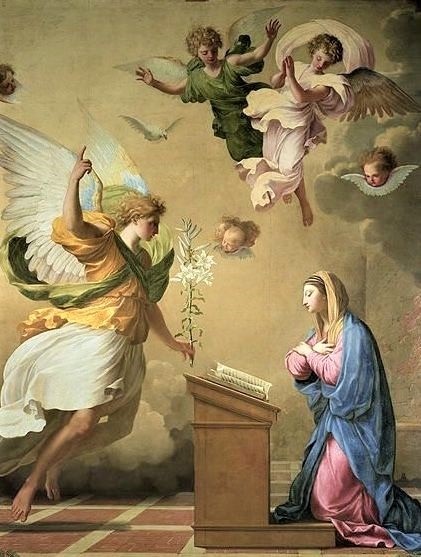 Yes, [sooner on Annunciation] we shall see this heavenly Ambassador of the Blessed Trinity coming down to the Virgin of Nazareth; let us, therefore, recommend ourselves to him, and beseech him to teach us how to celebrate, in a becoming manner, the grand Mystery of which he was the Messenger. Gabriel is one of the first of the Angelic Kingdom. He tells Zachary, that he stands before the face of God (St. Luke, i. 19). He is the Angel of the Incarnation, because it is in this Mystery, which apparently is so humble, that the power of God is principally manifested: and Gabriel signifies the strength of God. We find the Archangel preparing for his sublime office, even in the Old Testament. First of all, he appears to Daniel, after this Prophet had had the vision of the Persian and Grecian Empires; and such was the majesty of his person that Daniel fell on his face trembling (Dan, viii. 17). Shortly afterwards, he appears again to the same Prophet, telling him the exact time of the coming of the Messias: Know thou and take notice: that from the going forth of the word to build up Jerusalem again, unto Christ the Prince, there shall be seven weeks and sixty-two weeks (Dan, ix. 25), that is, sixty-nine weeks of years. When the fulness of time had come, and Heaven was about to send the last of the Prophets,—he, who after preaching to men the approach of the Messias, is to show him to the people, saying: Behold the Lamb of God, who taketh away the sins of the world,—Gabriel descends from heaven to the temple of Jerusalem, and prophesies to Zachary the birth of John the Baptist (St. Luke, i. 13), which was to be followed by that of Jesus himself. The hour at length came, when the Mother of the Emmanuel was to bring forth the Blessed Fruit of her virginal Womb. Jesus was born amidst poverty; but Heaven willed that his Crib should be surrounded by fervent adorers. Ad Angel appeared to some Shepherds, inviting them to go to the Stable near Bethlehem. He is accompanied by a multitude of the heavenly army, sweetly singing their hymn: Glory to God in the highest, and on earth peace to men of good will! Who is this Angel that speaks to the Shepherds, and seems as the chief of the other blessed Spirits that are with him? In the opinion of several learned writers, it is the Archangel Gabriel, who is keeping up his ministry as Messenger of the Good Tidings (St. Luke, ii. 10). These are the claims of the great Archangel to our veneration and love; these are the proofs he gives of his deserving his beautiful name,—the Strength of God. God has employed him in each stage of the great work, in which he has chiefly manifested his power, for Jesus, even on his Cross, is the Power of God (I Cor, i. 24), as the Apostle tells us. Gabriel prepares the way for Jesus. He foretells the precise time of his Coming; he announces the birth of his Precursor; he is present at the solemn moment when the Word is made Flesh; he invites the Shepherds of Bethlehem to come to the Crib, and adore the Divine Babe; and when Jesus, in his Agony, is to receive Strength from one of his own creatures, Gabriel is found ready in the Garden of Gethsemani, as he had been at Nazareth and Bethlehem. The Missal for the Laity according to the use of the Holy Roman Church, 1846.